Thank you for reading the entries to the Tempur-Pedic Signature Contour mattress and Ergo Adjustable base contest. There were over 2,000 votes! 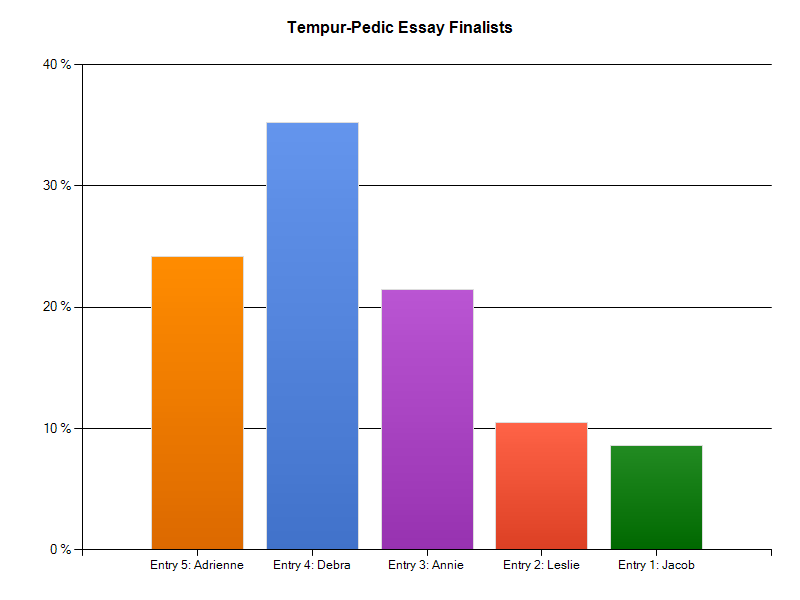 I want to again thank all the entries and congratulate the five finalists for their wonderful essays. However, there can only be one winner. Congratulations to Debra K! I know you’ll enjoy a good night’s sleep like I am. Voting results by finalist are shown below. Congrats to Debra! I am a bit jealous considering my mattress is on the floor and I don’t even have a bed frame. (I could have one, just haven’t gotten one!) Haha. Enjoy it! Next post: Social Security – Entitlement, Ponzi Scheme or Something Else?